Notes: An original production from 8-bit. Sogo and his friend Kaon live in the mining town of "Garden Indigo", a rare verdant spot on the mostly desolate planet "Gift," searching for rare crystals when they aren't either in school or helping Sogo's stepfather Do-Mon run his cafe. One day, while trying to avoid Kaon's pushy fiancee Roman, the two wander deep into an underground cave and come across a lake. Sogo stumbles upon and accidentally awakens a mysterious girl with shiny blue hair and red eyes, who seems to take an immediate liking to him; soon after, though, the cave is beset upon by soldiers in mechas, who are looking for the girl, Felia. 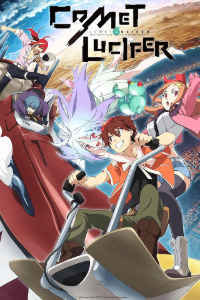 With Comet Lucifer, there's yet another entry in the canon of anime, mecha anime in particular, in which the male lead finds himself immersed in some sort of great adventure involving the fate of the universe almost entirely because of his fascination with a mysterious and otherworldy female character. RahXephon is probably one of the less cringe-worthy examples of this, while Evangelion plays with the trope (via Rei Ayanami) for the exact purpose of making the audience cringe, but since then, we've had show after show come along to help prove how tiresome it can be, with 2014's Captain Earth being a recent and especially bad example. 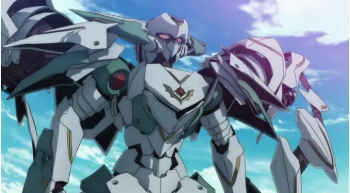 Comet Lucifer, sadly, also finds itself joining an undignified club of anime whose sums are somehow less than the worth of their parts: it's in fact a nice-looking series with a beautiful fantasy setting and enough likable characters to get by, and yet there are no interesting ideas at work to make any of this count. 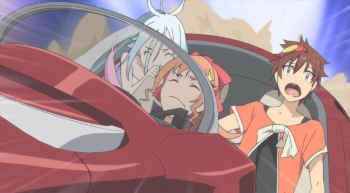 So I'm ultimately disappointed in this show, because it caught my attention for just long enough to make me want to see it through, only to fizzle out, and while I can imagine that some might enjoy Comet Lucifer simply for Felia's cuteness, I'd argue that it's otherwise one to skip. 8-bit isn't exactly a household name as anime studios go, and their previous track record has consisted mainly of light novel adaptations like Infinite Stratos and The Fruit of Grisaia that I, frankly, have absolutely no interest in watching; in fact, aside from the passable Tokyo Ravens, Encouragement of Climb is the only show they've made that I'd even describe as "good." 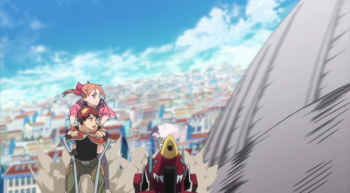 But while the gorgeous landscapes in that series probably stem more from the original manga author's appreciation of Japan's natural wonders more than anything, the studio did a rather nice job of bringing the girls' hiking tales to life, hinting that it was capable of making high-quality anime if it had something good to work with. Following on that, Comet Lucifer is the first original production they've attempted, and it's clear to me that the staff put their hearts into drawing and designing this show, even if I'd describe the animation as being more than a bit jerky by mecha standards. The variety of oddly outfitted cars, trucks, and scooters, combined with the cobblestone streets and antiquated-looking buildings, gave something of a steampunk ambience to the isolated "gardens" in the Comet Lucifer universe, which seem to be where most (if not all) of humanity lives, and I was reminded pleasantly of Patzu's hometown in Castle in the Sky, with the working-class ethos of both towns possibly contributing to this impression. The clouds and buttes of the Negev-esque wildernesses between the towns are beautifully rendered, too, as is the background art in general. It's a show that's just bright, varied, and colorful, and while I wouldn't call any of the character design especially inspired or original, the staff obviously had fun with details like Shogo's steampunk goggles and Roman's very frilly pretty-boy button-down. Comet Lucifer also plays around with the varied clothing and architecture of the people from other "gardens," which is an aspect I wish the show had spent more time on; for example, the main characters very briefly pass through a town whose clothing and architecture seem right out of Turkic Central Asia, and given that the town happens to be celebrating a wedding at the time, I'd like to think that it might be a nod to A Bride's Story. Now, the design and setting of Comet Lucifer make me think that even if the people responsible weren't top-notch artists, they had some fun drafting this series, and I have to give the show some points for that. Sadly, there are some other aspects that aren't nearly as fun, simply because it feels that whoever was responsible for them did a lazy job. From a production standpoint, for example, I basically have nothing to say about the music, except that the OP sounds like a busy, auto-tuned, and entirely skippable piece of karaoke. As for the writing, my point about the tiresomeness of the "mysterious girl" archetype becomes pertinent, here. Felia is, without a doubt, a cute character, and in both appearance and behavior she is practically a fairy, being innocent, bubbly, and childlike to an extreme degree. But while this may make her somewhat endearing, she comes across as passive because of this: she's the center of a convoluted science fiction plot that (somehow) ultimately manages to invoke the origin of life on this planet, but she doesn't really even know it, and to that end, most of the action is left to Sogo and to Do-Mon. To make matters worse, Comet Lucifer introduces a sort of "familiar" character in the form of Moura, and her mere presence in the show creates a plot hole. Normally, such figures provide some sort of explanation of the character's role, be it for the character herself (as in many magical girl shows) or for the sake of the character's comrades, but here, it's established that Moura doesn't actually know anything about Felia or her origins except that she herself is there to keep her power in check. This makes her presence feel superfluous, which isn't helped by the fact that she doesn't seem to do much besides yell at the other characters, only to abruptly become important at the very, very last minute, when she inexplicably gains a human form. And this leads me to another major problem I have with Comet Lucifer: Sogo isn't necessarily a bad character, but the degree to which everyone else, Do Mon aside, comes across as completely ineffective gives me the impression that the show is entirely set up simply to make him look cool. Felia, in spite of being a mythic being with supposed overwhelming powers, can't do a whole lot on her own, and Moura's presence doesn't really help with that. Kaon, who's admittedly a fairly pleasant character, doesn't get to do a whole lot besides drive the group's vehicle (did Sogo tempt her with the lead-off track to Rubber Soul?) and be the third arm of a tedious love triangle between her, Sogo, and Felia. 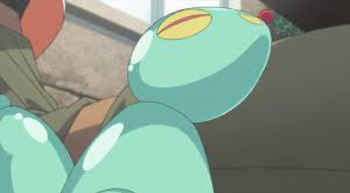 On that note, the show awkwardly transforms Felia into a more "mature-looking" if still very naive character midway through the series (complete with some gawking on the male characters' part at her new, erm, "development"), and while the writers try to fit this into the plot with some gobbledygook about mecha transformations, it's obvious that they realized that since they absolutely had to go for the love triangle approach, having Felia be a six-year old wouldn't exactly make sense. Roman is basically a fop, useful for comic relief at the very least but not for advancing the plot of the actual show. Do Mon, meanwhile, is established as having taken charge of Sogo in order to atone for his dark past, and while it's a hackneyed plot element, I wouldn't say it's necessarily bad, since it does introduce (via flashback) Sogo's geologist researcher mother. Indeed, the image of her hunched over her microscope with her infant son on her back could make for a compelling feminist image under the right circumstances, and I actually rather enjoyed her appearance in these flashbacks. Unfortunately, it ends on the love-of-life-dying-as-motivation trope, souring it all, and I lost interest in Do Mon's tragic action hero stint later on simply because I'm so tired of it. 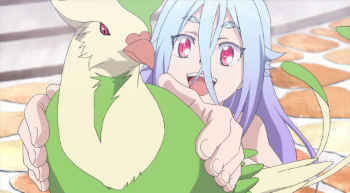 A bigger part of my frustration with Do Mon's arc, though, is that the show did a very poor job of defining the villains and their motivation for harassing the main characters beyond the generic explanation of Felia's hidden powers. This sort of laziness is a major pet peeve of mine, and if you remember the review of The Pilot's Love Song that Stig, Tim, and I co-wrote, one of my biggest gripes was the fact that in spite of how dramatic the show was trying to be, we never had any idea at all who the bad guys were or why we were supposed to care about the conflict involving them. Comet Lucifer struggles with this mightily, and while at the very least we see the bad guys I never fully understood who they were all working for, what they were doing, or why they were doing it, simply because they are all introduced in a haphazard manner. 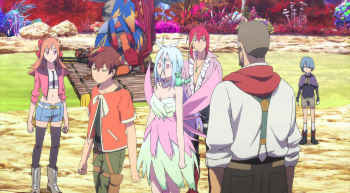 At the very start of the show, a rushed battle scene establishes that some of the bad guys want Felia for her powers, which is to be expected, while some equally rushed scenes tell us that there are several factions, including some people who have ties to Do Mon and who were involved in the incident that cost Sogo's mother her life, but there are far too many people that appear at seemingly random times, with little rhyme or reason as to why Villain A, as opposed to Villain B, should be attacking the protagonists at that particular moment. It's hard to care about the show because the battle that Sogo and his friends are fighting feels fuzzy, being obscured in a haze of bland mecha battles and ultimately ending with a cackling big-baddie megalomaniac appearing and soliloquizing nonsensically, leading me to tick off another entry on my personal list of reviewer's deadly sins. 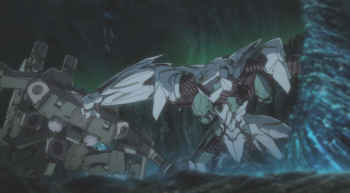 Comet Lucifer also steals shamelessly from the FullMetal Alchemist playbook by having a shapeshifter villain (never previously seen or referenced) appear to take the form of somebody's loved one in order to get their guard down and kill them, and given how little setup there was to this character's abilities, this scene struck me as even more cheap than it normally would. And I suppose that ultimately, my biggest gripe with Comet Lucifer is that so much of it feels cheap. We have some decent characters, but most of them are wasted on half-baked plots that have been better-explored in better anime fantasy series, and the writers hope to lure their audience along with hackneyed gimmicks in lieu of actually fully writing out a conflict and series of character arcs that we can truly care about. The irony is that the most enjoyable episodes of the series are a number of slice-of-life esque episodes near the beginning that have practically nothing to do with either mecha or the central plot; they simply do a nice job of establishing what life in this universe is like. The effort put into those parts of the show truly does make me want to forgive it, but unfortunately, the flimsiness of the plot ultimately sends it down the toilet. Recommended Audience: As mecha shows go, it's fairly tame in regards to both sexuality and violence; some of the female characters are somewhat scantily-clad, but only mildly so by fantasy standards. A handful of characters die graphic deaths, but this is limited to a few scenes, and the mecha battles themselves seem to rarely (if ever) cause noticeable injury or damage.